Leading up to our joblessness I found myself going through a myriad of emotions ranging from “eh” to “UGH.” And in an emo turn of events, I felt the need to draw parallels between my inconsequential feelings and death. Which brings me to the point of this entry: the Seven Stages of Unemployment. We had the advantage of knowing when our time was coming to an end two months ahead of time. So when we first found out about our end date, we were like “Shrug. We’ll cross that bridge when we get to it.” We then proceeded to think little of our future and instead spent money on stupid things, like expensive juices, super specialized kitchen utensils, and patterned cupcake liners. Because who knows when you'll need a stainless steel fork designed especially for olives? Before long it sinks in that you’re not going to have a job. And like most people (well, Americans at least) your first instinct is to blame everyone but yourself. You become bitter as you start to think about all the idiots/jerks/former pedophiles who are out there making money instead of you, a perfectly normal person of average intelligence who recycles. 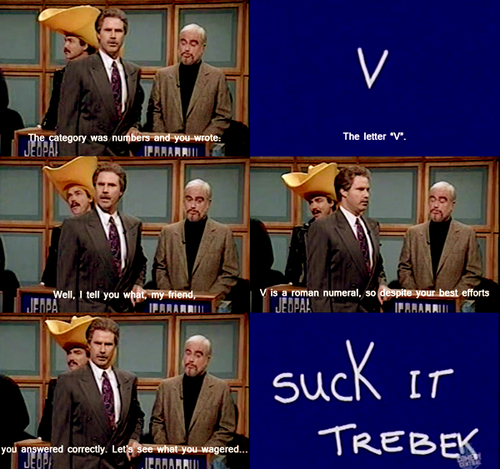 Everything’s wrong - the company’s wrong, the government is wrong, Alex Trebek is wrong (that’s how far you’re willing to go into self-righteous delusion). Once the bitterness wears off, you think of all the things you can now do with your free time. These things aren’t necessarily work-related - some of them are goals that will just make you a better person. Some of these things will be perfectly achievable goals: doing some freelance, eating more fruit, finding out what a Roth IRA is. Other things will be downright impossible: painting the house, becoming a landscape designer, reaching enlightenment. Actual things that have crossed my mind: learning krav maga, learning Tagalog, doing the Special K challenge, developing triceps of steel, design and manufacture a line of makeup bags which I will give away to needy high schoolers in exchange for market research, and getting over my hangup of opening my eyes underwater. I'll never be her if I can't open my eyes underwater. "Don't buy Tupperware, buy containers with lids. We're people, not kings." You’ve been thinking about unemployment so much that you just want it to happen already. You’ve been talking about it so much that you don’t sound fake-excited anymore and you just want the headspace to think about something else. Also you just had an awesome weekend where you sat around in sweats all day and you’re looking forward to doing that 24/7. This guy knows how to rock sweats and watch you while you sleep. You feel like you should be doing something to help out the bleak state of your future, but you can’t so you do little things that make you feel like you’re doing something. These actions can range from starting a blog to buying your unemployment wardrobe. What constitutes an unemployment wardrobe, you ask? Stylish basics. When you’re unemployed it’s important to be comfortable but not look like you’ve completely given up on life. These things won’t get you a job, but they’ll make you feel like you’re taking steps towards getting a job. And if the US government has taught us anything, it’s that what it feels like you’re doing is way more important than what you’re actually doing. These guys are all rocking stylish basics. Normal people results may vary. It’s happened. You’re unemployed. And like morning breath, the inevitability of the sun exploding, and the appearance of fine lines and wrinkles, you have no choice but to accept it. But hey, you could have worse things forced upon you. Skunks, for example. A labyrinth riddled with spiderwebs. There’s another one. You could go on. Really. You have all the time in the world.